Burn Theatre Company presents Peter and the Starcatcher in the Abdo New River Room of the Broward Center for the Performing Arts. This production in Ft. Lauderdale will be followed by a one week run at the Aventura Arts and Cultural Center in Aventura (www.aventuracenter,org) , and a one week at the Old School Square Crest Theatre in Delray Beach, FL (www.oldschoolsquare.org . Peter and the Starcatcher provides a backstory for the character Peter Pan, and serves as a prequel to J. M. Barrie’s Peter and Wendy. The action begins in a bustling port of the British Empire. There, Lord Leonard Aster (Matthew Korinko) is accompanied by his precocious daughter Molly (Krystal Millie Valdes) and her nanny Mrs. Bumbrake (Noah Levine). Two identical trunks are delivered to the port. One of them contains a precious cargo belonging to the Queen, who has appointed Lord Aster as its custodian. He’s to travel with the trunk aboard the Wasp (the fastest ship afloat) to the remote kingdom of Rundoon. The Wasp’s captain is an old school chum of Lord Aster’s named Captain Robert Falcon Scott (Johnbarry Scott). The other trunk is a decoy filled with sand which is to be carried by an old and weather-beaten ship, The Neverland, captained by Bill Slank (Joseph Paul Pino). Lord Aster has paid Slank to transport Molly and Mrs. Bumbrake aboard the Neverland to Rundoon as well. Amidst the bustle of the port, the sinister Slank swaps the trunks so that the Queen’s cargo is loaded aboard the Neverland and the identical sand-filled trunk is loaded onto the Wasp. Grempkin, who is the schoolmaster of the St. Norbert’s Orphanage for Lost Boys, sells three orphan boys named Ted (Corey Vegas), Prentiss (Robert Fritz), and Boy (Jordan Armstrong) to Slank. Grempkin tells the boys they’ll serve as helpers to the King of Rundoon, but Slank implies there is a more dangerous outcome in store for them. After realizing that there is no one who cares enough to speak for the orphans, Boy (later given the name Peter) proclaims that he hates grownups. Aboard the Neverland, Molly tells the Boy about Starcatchers, a handful of people appointed by the Queen. Molly explains that a Starcatcher’s primary duty to collect starstuff as it falls to earth and dispose of it in the world’s hottest active volcano, Mount Jalapeno, which is on Rundoon. Though starstuff is magical, as it transforms everyone into a magnified version of whatever it is they wish to be, it can be very dangerous in the wrong hands. While she is a Junior Starcatcher, her father Lord Aster is the Starcatcher assigned to the secret mission of disposing of the starstuff. The British Lieutenant Greggors, who has led Lord Aster aboard the Wasp, reveals to Lord Aster that his real name is Smee and the seamen are pirates. Captain Scott and Lord Astor are taken captive and Smee introduces their leader, who is the most feared pirate captain on the high seas, Black Stache (Clay Cartland). A storm lands them all on an island inhabited by a people called the Mollusks, complete with a giant crocodile. The trunk of starstuff has washed ashore the island transforming the lives of some of the characters and forever setting the stage for the beloved tale of Peter Pan. This production of Peter and the Starcatcher is filled with silly slap-stick and broad buffoonery. It makes great use of the presentational style reminiscent of children’s theatre at its best. The role of Black Stache may as well have been written for Clay Cartland. He is like a pig in the mud reveling in the over-the-top comic nature of a role designed to chew the scenery. His only flaw is that he is sometimes self-indicating, with a suppressed smile before a punch line or after a funny bit. Cartland obviously understands and flourishes in this type of comedy, and he is very entertaining to watch. Jordan Armstrong’s portrayal of The Boy (Peter) has an honesty that is very appealing. It is neither cloying or pretentious; and captures the youthful essence of the character, while still being mature. His partners in his journey, Prentiss and Ted, are played by Robert Fritz and Corey Vegas. Fritz has an eager air, and a fresh-scrubbed look that works well for the role of the would-be leader Prentiss. Vegas is heavy-handed in his approach to the quirky, ever-hungry Ted; making him more annoying than enjoyable. Krystal Millie Valdes is an earnest Molly, wearing her heart on her sleeve as she is led by both duty and curiosity. Her accent work was the most solid in the show (some actors would sometimes forget their characters even had accents), and she has admirable focus. Following Valdes’ focus is probably the best way to stay on track in this production. I had two separate people tell me they thought the show was very funny, but didn’t really know what was going on. The small size of the stage for this production means that some locations are done representationally, and actors not clearly taking on another role for those moments leads to potential confusion on the part of the audience. Areas of the stage perhaps could be more defined by lighting or scenic design; and there is need of cleaner direction of the acting beats. There is always something to look at amidst the flurry of activity, but we are not always sure of when a plot point is being established, or when it is all just spectacle and fun. 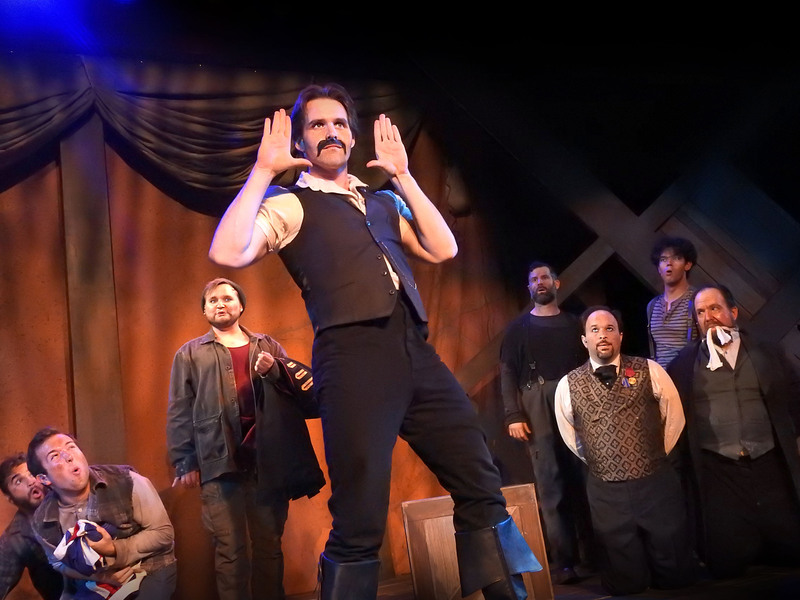 With loads of high energy from the entire cast, you are bound to be swept away by the humor and heart of Peter and the Starcatcher, but do try to stay on track to catch the twists and turns of the actual story line of this well-written piece. The 2006 novel “Peter and the Starcatchers” by Dave Barry and Ridley Pearson was adapted for stage by Rick Elice in 2009 and premiered at the La Jolla Playhouse in California. After playing Off-Broadway at the New York Theatre Workshop in 2011, it opened on Broadway at the Brooks Atkinson Theatre on April 15, 2012, closing on January 20, 2013 after 18 previews and 319 regular performances. The Broadway production received two Lucille Lortel Awards, one Obie Award, one Drama Desk Award, and five Tony Awards: Best Performance by an Actor in a Featured Role in a Play (Christian Borle); Best Sound Design of a Play (Darron L. West); Best Costume Design of a Play (Paloma Young); Best Scenic Design of a Play (Donyale Werle); and Best Lighting Design of a Play (Jeff Croiter). It reopened Off-Broadway at New World Stages in March of 2013 and ran through January 12, 2014. Started in 2009, Slow Burn Theatre Company is a professional theatre company hiring equity and non-equity actors. Their mission is to provide South Florida’s diverse population with opportunities to experience high quality, daring, contemporary and intelligent works of musical theatre through attendance, employment, and/or educational and community outreach programs. If you miss this Slow Burn Theatre Company production of Peter and the Starcatcher in Ft. Lauderdale, you may catch it in Aventura and/or Delray Beach. For information on Slow Burn Theatre Company, call 954-462-0222, or visit www.slowburntheatre.com. The Broward Center for the Performing Arts is located in the Riverwalk Arts & Entertainment District at 201 SW Fifth Avenue in Fort Lauderdale, FL. The Broward Center for the Performing Arts houses the Au-Rene Theater, the Amaturo Theatre, and the Abdo New River Room, and has affiliated venues at the Parker Playhouse, the Rose and Alfred Miniaci Performing Arts Center, and the Aventura Arts & Cultural Center. One of America’s premier performing arts venues, the Broward Center for the Performing Arts presents more than 700 performances each year to more than 700,000 patrons, showcasing a wide range of exciting cultural programming and events. Guest experiences at the Broward Center include the all-inclusive LATAM AIRLINES CLUB LEVEL, spectacular riverfront views for special events in the Huizenga Pavilion, waterfront dining at Marti’s New River Bistro and innovative classes and workshops for all ages at the Rose Miniaci Arts Education Center. With one of the largest arts-in-education programs in the United States, the Broward Center serves more than 150,000 students annually. The Broward Performing Arts Foundation, Inc. receives and maintains funds to sustain, develop and secure the future of the Broward Center. For more information, visit www.BrowardCenter.org. Slow Burn Theatre Company production of Peter and the Starcatcher will be appearing through November 26, 2017, in the Abdo New River Room of the Broward Center for the Performing Arts. Performances are Thursday–Saturday at 7:30 p.m. and Sunday at 2 p.m. Tickets for this production are $20 – $45. Ticketmaster is the only official ticketing service of the Broward Center, Parker Playhouse and affiliated venues. Buy tickets online at BrowardCenter.org or Ticketmaster.com; by phone at 954-462-0222 or the Broward Center’s AutoNation Box Office. The Broward Center for the Performing Arts is located in the Riverwalk Arts & Entertainment District at 201 SW Fifth Avenue in Fort Lauderdale.